Industrial and bucolic: these two descriptors are not commonly associated with each other today - and yet together they defined the 19th-century sightseeing attractions of New York State. Particularly in the time of the Erie Canal, the state's landscape was perceived and promoted as hybrid condition, its countryside understood as both an idealized site of natural scenery and as the raw material of exciting new technological advancements. For environmental and art historians alike, the "untamed West" often emerges as a central theme - a trope of untouched nature against which to measure more complex understandings of entanglements between humans and nonhumans. Environmental historians such as William Cronon and Richard White have worked to question the popular notion of pure untarnished American wilderness that emerged with Western expansion and conservation, seeking instead to recognize the hybridity of landscape and the continual entanglements that occur between nature and culture. Likewise, art historians and visual theorists such as Rosalind Krauss, James Ackerman, and Jonathan Bordo have interrogated the role of picturesque imagery in constructing, conditioning and reinforcing the ways that we view wilderness, particularly as exemplified in the American West. Discussions such as these can be newly informed by exploring the ways of seeing practiced by New York State tourists during the era of the Erie Canal. In a period when Hudson River School portrayals of untouched nature could be found alongside celebrations of natural resource-exploiting industrial power, how did an emerging tourist industry promote sightseeing? How were picturesque and industrial scenarios interrelated in travel imagery, accounts, and promotions? Finally, how were tourists' picturesque imaginations conditioned by journeys along highly industrialized waterways to destinations of idealized natural splendor, and what ways of seeing emerged as a result? Answering such questions offers a rather complicated portrayal of 19th-century relations between landscape and industry, thereby contributing to discourses that problematize notions of a pristine and untouched American wilderness. The Kroch Division of Rare and Manuscript Collections enables such an investigation; its promotional materials, visual documents, and written accounts of 19th-century travels in New York State provide examples of how tourists understood relationships between industry and wilderness at this time. These documents reveal how hybrid notions of landscape were propagated and embraced through the material cultures of tourism in the time of the Erie Canal. From the 1825 opening of the Erie Canal to its decline in the 1880's, reconstructed waterways played a significant and multifaceted role in the growth of New York State and the nation at large. The Erie Canal stretched from Albany to Buffalo, thereby linking the Hudson River to the Great Lakes. It enabled people and goods to travel efficiently from the East Coast to the Midwest, all via waterways. Spur canals such as the Seneca and Oswego further knit the canal system into the rural fabric of the state, enabling water-based transit to towns such as Seneca Falls and Ithaca. In addition, land-based transit linked numerous small towns to strategic canal locations: stagecoach, train, and steamboat lines connected with canal boats to provide newly expedient transit routes to Western lands. This networking instigated a broad harnessing of water throughout New York State. Catalyzed by this massive re-engineering of waterways, much of the state underwent rapid industrial and agricultural development. Population boomed in Albany, Buffalo, Rochester, Utica, and many towns along the canal route, and migration to the Great Lakes region increased (Stradling 47). Mills, dams and factories located along waterfalls and creeks in newly accessible remote areas, providing income and electrical power to small communities. As they grew in economic power, New York waterways also gained ideological currency. Altered waterways - part nature and part construction - were understood simultaneously as romantic wilds and as innovative manifestations of American ingenuity. Matthew Gandy expresses this joint economic and ideological shift while discussing the 1842 opening of New York City's Croton Aqueduct: "with the extension of the city's ecological frontier into upstate New York, the urbanization of nature and the naturalization of the urban could advance in tandem" (Gandy 34). The ideologies surrounding altered waterways were perhaps most apparent in the material cultures of 19th-century tourism. Guidebooks, stereoviews, published accounts, and tourist journals all celebrated the hybrid power of waterways - from waterfalls to dams, springs to millponds, canals to lakes. At the western terminus of the Erie Canal, Niagara Falls became a "must-see" site - the destination of a Northeastern Grand Tour, with tourists travelling via the canal to reach the falls (Penner 30; Sears 12; Stradling 82). We will return to tourism's idealistic dimension - but first, we must understand the ways in which tourism operated as a logical extension of 19th-century New York State's growing manufacturing and agricultural economies. Increased wealth brought new leisure, and suddenly accessible destinations were particularly alluring to an expanding American middle class (Sears 4). Thus the emerging tourism trade operated as an industry among industries, both contributing to and benefiting from the increased prosperity of the canal region. Tourism often enfolded with other industries in highly transparent ways. Transport of goods throughout the state was inseparable from the transport of tourists: canal boats and railway cars carried both between newly booming towns. Indeed, traveler information on the 1827 Tourist's Map of the State of New York (fig. 14) mixed sightseeing suggestions with costs of goods shipped, listing rates for pelts, salt, gypsum, furniture, coal, and more. For the tourist, the result of this mixed transport was an up-close view of novel manufactories, as well as a traveling experience dependant on the logistics of shipping goods. The travel diary of James Kite offers a glimpse into the tourist experience. Kite traveled for two weeks in August of 1835, beginning in his hometown of Philadelphia and traveling as far west as Ithaca, before returning home. He described a packet boat delay (in this case in Harrisburg, along the Susquehanna River): "I rose by day light and finding it would take the crew an hour or more to take in 3 additional tons of freight I strolled through our seat of government to reconnoiter" (Kite 10). Published two years after the 1825 opening of the Erie Canal, this map shows New York State's canals and stagecoach roads - the two predominant means of travel at this time. The map measures 19 x 20 inches and is foldable: tourists could easily travel with it. Railroads are not listed, as they were only beginning to be built at this moment. The map's notes include sightseeing attractions at Trenton Falls and Utica, as well as packet boat fares for both human passengers and various forms of freight. On packet boats, workers prepared sleeping cabins and served meals, while holds were filled with a wide range of goods. 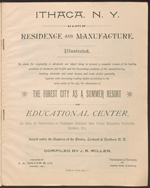 The text of this guidebook's cover page depicts one way in which industrial innovation and natural scenery were simultaneously advertised to nineteenth-century New York State tourists. This is one of many promotional materials produced by the railroads at this time, proclaiming the interest and value of destinations along the route. Of particular interest here is the way in which this guidebook was marketed to manufacturing and tourist industries alike, without differentiating between the two. We might understand this as evidence of the nineteenth-century tourist's interest in both natural and industrial sites, or as evidence of the desires of town boosters and railroads to capture both tourist and manufacturing dollars. In either case, manufacturing and tourism were mutually reinforcing industries at this time. Stereoviews were not only sold onsite, but also produced near-site. The stereoview collection of the Kroch Division of Rare and Manuscript Collections includes views from sets such as "Fall Creek Series" and "Lake and Glen Scenery," both published in Watkins, NY, and "Views of Ithaca and Vicinity," a set of 27 stereoviews published in Ithaca, NY. As with guidebooks, promotional sets were also produced by railroad companies, including the Syracuse, Geneva, & Corning Railroad and the Northern Central Railway. Thus both guidebooks and stereoviews followed highly localized patterns of production. Produced by parties that stood to gain by increased travel and business in New York, guidebook and stereoview imagery was strategically designed to entice tourists and encourage investors. Guidebook copperplates and engravings picturesquely idealized the conditions of canal and railroad travel (fig. 16 - see also the background image on the website's Home page). Such illustrations showed modes of transit gently tucked into elegant and lush landscapes with sweeping vistas. The resulting message was clear: to travel via canal or railway was to commune with the grand landscapes of the American countryside. Such drawings were both idealistic and propagandistic in their charm; expressing a collective optimism that rural New York could embody a gentle and elegant merging of nature and industry. Each of these images depicts a new mode of travel gently tucked into the rural landscape, suggesting a remarkable level of congruence between infrastructure and wilderness. Both images are picturesque in convention, with lush vegetation, sweeping vistas, and elegantly framed views. The top image depicts a particularly scenic moment on the Erie Canal. The solitary appearance of the boat is probably inaccurate, given the huge amount of canal traffic at this time. On the bottom we see a rail bridge and train in the distance of an otherwise perfectly rural scene. These images are clearly promotional, idealizing the modes of travel that they describe. Propaganda notwithstanding, optimistic depictions of the relationship between progress and wilderness were congruent with widely held beliefs during this period. Did tourists share these promotional ways of seeing, or resist them? Kite and Burroughs, at least, did both. Sometimes they hewed closely to guidebook depictions. 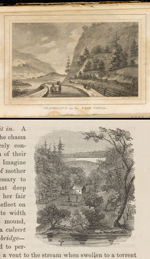 When Kite noted that between Ithaca and Owego "the rails have graceful curves in every direction" (Kite 8), he could just as easily have been describing a guidebook engraving as the railroad itself (background image, Home page). As with Kite's reference to graceful curving railroad tracks, Burroughs' narrative fits remarkably well with guidebook images of canal travel. Comparing these comments, one might wonder whether Kite read Hawthorne's account prior to travel - but no, Kite's account predates Hawthorne's. More likely, the canal's boring and soporific quality was a popular topic of discussion among travelers. Though the canal passed through a range of scenic landscapes, its unpleasant portions developed a reputation. Thus while promotional and published literature clearly influenced travelers' perceptions of the canal, less positive narratives also found their way into tourist experiences and accounts. Clearly Burroughs did not find conflict between the aesthetic beauty of the spring above and the utility of waterways below. Rather, her observations slip easily from sparkling waters to aqueducts and industrial productivity. Indeed, many Americans in the 19th century did not consider industry and wilderness to be in conflict. Not only were favorable comparisons regularly made between the two, but also picturesque imagery often integrated references to industry into otherwise bucolic scenes. This partly reflected tourists' interests in observing signs of innovation and societal improvement. Barbara Penner remarks that 19th-century New York tourists visited a variety of sites that would seem disparate today, noting that the era's honeymoon destinations in particular "present modern eyes with a bizarre patchwork of civic, military, institutional, religious, industrial, technological, natural, and urban sights" (Penner 32). What's more, the very pattern of industrial expansion at this time lent itself remarkably well to a picturesque aesthetic. David Nye notes that coupled with the canal's broad reach, the 19th-century industrial use of water power caused a distinctly scattered form of industrial development, with numerous mills located along falls and creeks in remote places. As a result, in this moment "Americans at first believed that factories might not pose a contradiction to the natural world but might extend and complete it" (Nye 112). In this light we must revisit our reading of guidebook engravings, for Nye's observation on the complementary relationship between nature and industry reveals a new aspect of their idealized imagery. What initially seems to have been an act of promotional elision was also an act of early-industrial optimism during a brief moment when innovative water-powered factories actually were tucked into idyllic landscapes. This notion of nature and industry in complementary extension and completion is perhaps most clearly visible in stereoviews of New York waterfalls. In their abundance and thematic reiterations, stereoviews make this uniquely hybrid way of seeing particularly apparent. For example, figure 17 shows an image of Wells Falls, along Six Mile Creek in Ithaca, NY. Above the falls is the deteriorating structure of the Van Natta Mill, a flour mill that used the falls for hydropower. Given that it would be quite easy to photograph the waterfall without the mill in the frame, this image was clearly taken so that the mill would be included and prominently displayed. We also see two men, proxy tourists if not actual ones, standing at the foot of the falls. Produced in Warsaw, NY as part of a series on "Ithaca Scenery and Cornell University," this stereoview shows the bucolic industrial aesthetic that was so proliferate in nineteenth-century tourist materials for New York State. The image shows Ithaca's Wells Falls with the picturesquely decrepit Van Natta flour mill clearly in view. The mill was owned by brothers James and John E. Van Natta, who also ran a feed business (Kammen 79). This view was most likely produced in the 1860's-70's, when local stereoview production was most common (Jaeger). People standing in the falls show the easy accessibility of this natural wonder to the visiting tourist. The note that F.H. Young drowned at Wells Falls hints at a sublime sense of power and awe that overtook more benevolent conceptions of industry and nature towards the end of the century. A not quite charming industrial structure, an impressive cascade of water, and two mysterious men standing by the falls - how might we best understand such an image? It is not nearly as picturesque as the guidebook engravings we considered earlier - the ruins is are not charming enough, the presence of the men is too literal, and there is no effort to aesthetically frame the view. Indeed, while images found in guidebooks are consistently picturesque in style, stereoviews show a slightly more peculiar mix of industrial and bucolic imagery. This can partly be explained by the mechanics of looking at stereoviews. Observed through a stereoscope, stereoviews lure the eye into the depth of the image as a body might move through a site - tracing foreground textures and edges, and then moving further back in successive steps. This travelling view is reinforced when the image contains trails, objects, and bodies at different depths within the image. In this way, the stereoview image engages the movement of the eye as a simulation of bodily wandering the actual paths and stairwells onsite. If one considers the fact that every 19th-century stereoscope user was a potential tourist, it is apparent that in its moment the stereoview operated as an enticing taste of potential adventure, a provocation to travel. But there is another aspect to the Wells Falls stereoview's peculiar mix of elements - one that returns us to the theme of landscape and industrial hybridity. Stereoviews of New York State used various compositional strategies to visually juxtapose, overlay, and stitch together built and natural elements in order to show them as inextricable. They displayed brand new railroad bridges trussed high over river rapids; precipitously constructed stairwells spanning gorges; tunnels and dams inserted into waterfalls. All of these scenarios, like the Wells Falls image, iterated a theme of the natural and the built in intrinsic connection. The layered representations of stereoviews thus operated in many ways. They surely satisfied both beauty-seeking tourists and industry-minded businessmen. They reflected popular understandings of the relationships between landscape and progress. They expressed a collective aspiration that industry and nature might develop in complementary ways. Finally, they showed waterfalls as they physically, materially existed in this moment - part constructed, part wild. For the tourist, visual depictions and actual sites were experienced together, mutually reinforcing and informing each other. Nineteenth-century New York State was thus cyclically viewed and described as a hybrid landscape: built, seen, imagined, and packaged as a mixed interrelationship between innovation and wilderness. There is one more observation to be made regarding the stereoview of Wells Falls, a remaining aspect that we must address. The caption of this image reads "Wells Fall, Six Mile Creek, where F.H. Young was drowned." Advertising drowning does not fit well with either strategies for promoting tourism or benevolent notions of harmony between nature and industry. How can the appearance of such danger be reconciled with other ways of seeing discussed here? Nineteenth-century industrial activity quickly grew beyond its initial pattern of individual mill buildings scattered through the countryside. Indeed, the moment of bucolic industry was over almost as soon as it began. By the end of the century, something had begun to shift in the ways that Americans viewed relationships between human progress and wilderness. 1880's-90's tourist accounts of Niagara commonly engaged references to death and danger, and notions of technology's victory over nature began to replace earlier narratives describing a gentle balance between the two (McGreevy 50). In this sense we might read the Wells Falls stereoview as predictive: that "F.H. Young was drowned" was a glimmer of a then nascent shift, expressing a sense of danger that gradually folded into the brief shining benevolence of the Erie Canal's first decades. Just as the Erie Canal, rapidly surpassed by railroads in reach and efficiency, began to be obsolete shortly after it was built, the grand aspirations connected with it also became quickly obsolete in American culture. As we now know all too well, industrial activity and economic development did not actually play so well with nonhuman others. Nonetheless, for the few decades in which the Erie Canal thrived, so too did an aspiration that American progress could embrace the natural world in complementary balance. In our present moment, we might find such optimistic conceptions of landscape/built hybridity to be particularly poignant - but also, perhaps, inspiring. Clarissa Burroughs, Journal, 1835, 22, Kroch Division of Rare and Manuscript Collections (KRMC), Cornell University Library. Cadwallader D. Colden, George Catlin, and William L. Stone, Memoir, Prepared at the Request of a Committee of the Common Council of the City of New York: And Presented to the Mayor of the City, at the Celebration of the Completion of the New York Canals (New York: Printed by order of the Corporation of New York, 1825), Kroch Division of Rare and Manuscript Collections (KRMC), Cornell University Library. James Kite, James Kite Diary, 1835, Kroch Division of Rare and Manuscript Collections (KRMC), Cornell University Library. D. Morris Kurtz, Ithaca and Its Resources: Being an Historical and Descriptive Sketch of the "Forest City" and Its Magnificent Scenery (Ithaca, N.Y.: Journal Association Book and Job Print, 1883), Kroch Division of Rare and Manuscript Collections (KRMC), Cornell University Library. Horatio Gates Spafford, A Pocket Guide for the Tourist and Traveler, Along the Line of the Canals: And the Interior Commerce of the State of New York (New-York: T. and J. Swords, 1824), A2, Kroch Division of Rare and Manuscript Collections (KRMC), Cornell University Library. Matthew Gandy, Concrete and Clay: Reworking Nature in New York City (Cambridge, Mass: MIT Press, 2002). Nathaniel Hawthorne, "The Canal Boat," New-England Magazine 9, (December 1835), 398-409. Carol Kammen, Place Names of Tompkins County (Ithaca: Office of the Tompkins County Historian, 2004). Patrick McGreevy, "Imagining the Future at Niagara Falls," Annals of the Association of American Geographers 77, no.1 (1987), 48-62. David E. Nye, American Technological Sublime (Cambridge, Mass: MIT Press, 1994). Barbara Penner, Newlyweds on tour: honeymooning in nineteenth-century America (Durham, N.H.: University of New Hampshire Press, 2009). John F. Sears, Sacred Places. American Tourist Attractions in the Nineteenth Century (Amherst, MA: University of Massachusetts Press, 1989). David Stradling, The nature of New York: an environmental history of the Empire State (Ithaca, N.Y.: Cornell University Press, 2010). William Jaeger, "The Stereoview in the U.S. - a Guide," Art History, University at Albany, New York, http://www.stereoviewmadness.com/stereoviewmadness/The_Stereoview.html(accessed November 17, 2011). The History Center in Tompkins County, http://www.thehistorycenter.net(accessed December 2, 2011). New York State Historical Literature Collection, Cornell University Library, http://ebooks.library.cornell.edu/n/nys/(accessed December 1, 2011).